My friends in Los Angeles and surrounding environs, mark your calendars for these dates: Friday, August 23, and Saturday, August 24. I want to meet you! 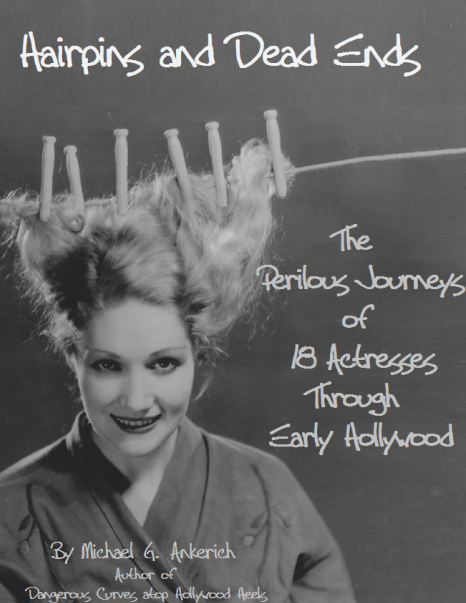 While I am in LA doing research for my new book, Hairpins and Dead Ends: The Perilous Journeys of 20 Actresses Through Early Hollywood, I am making appearances at two events. 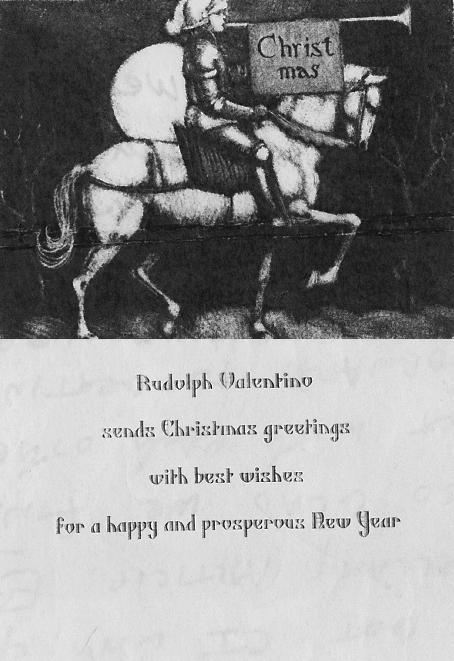 I am delighted to have been asked to speak at the annual Valentino Memorial, set for Friday, August 23, at Hollywood Forever Cemetery, in Hollywood. 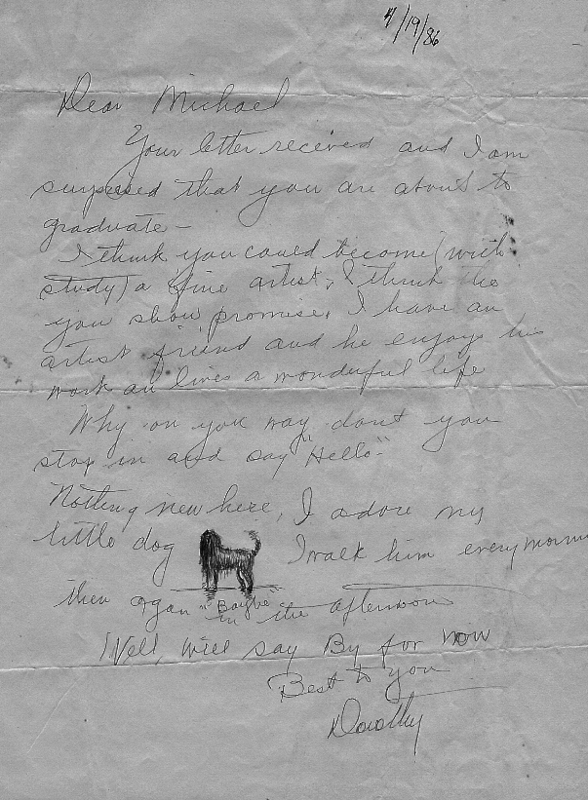 I will talk briefly about Rudy’s friendship with Mae Murray, a close relationship that lasted over 10 years. 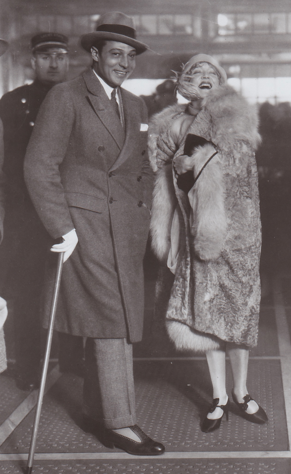 Rudolph Valentino and Mae Murray, fall of 1925. 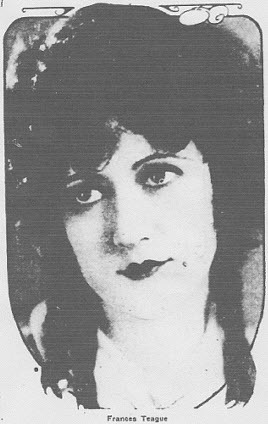 In preparation for the release of my latest book, Mae Murray: The Girl with the Bee-Stung Lips, I posted an interview on YouTube that Mae did in 1960. In this segment, she talks at length about Rudy. Check it out here! I have visited Rudy’s crypt countless times over the decades, but this is my first time attending the annual memorial. I’m looking forward to being there. 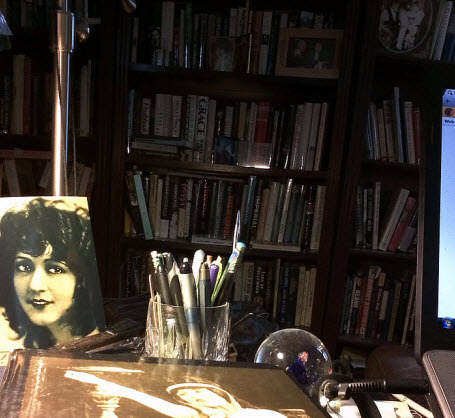 The next day, Saturday, August 24, at 4 p.m., I am signing my Mae Murray biography, Mae Murray: The Girl with the Bee-Stung Lips, at Book Soup, 8818 Sunset Blvd., West Hollywood. I would love to meet you! More details to come about these events! 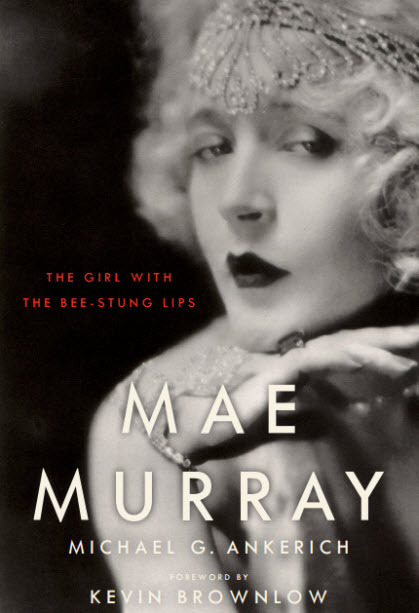 As I celebrate the publication of my new book, Mae Murray: The Girl with the Bee-Stung Lips, I wanted to share with you an interview Mae Murray gave in 1960 as she celebrated the release of her first biography by Jane Ardmore, The Self-Enchanted. The interview can be found on YouTube in three parts. Follow the links below. Enjoy! It is great to hear her voice! 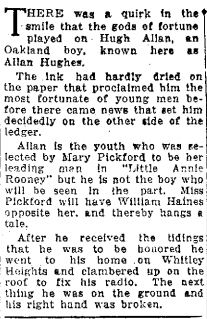 In 1925, Mary Pickford was not only America’s Little Sweetheart; she was Hugh Allan’s as well. 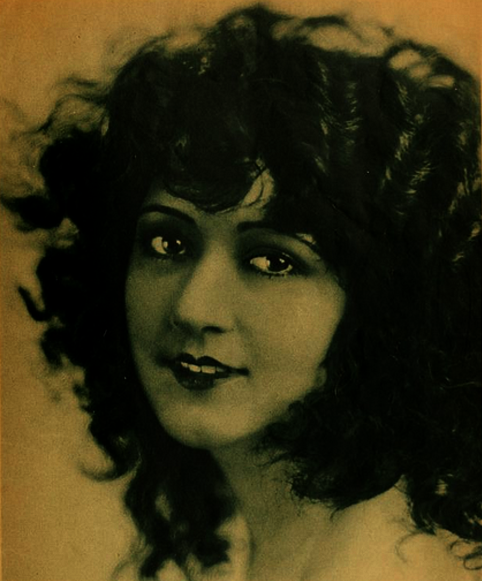 The handsome youth had played bit parts in films for the past several years, when in the spring of 1925, Mary plucked the 23-year-old from the ranks of an extra to play her leading man in Little Annie Rooney. Hugh had become what was thought impossible: an instant star. Hugh Allan, the silent hunk, in 1925. 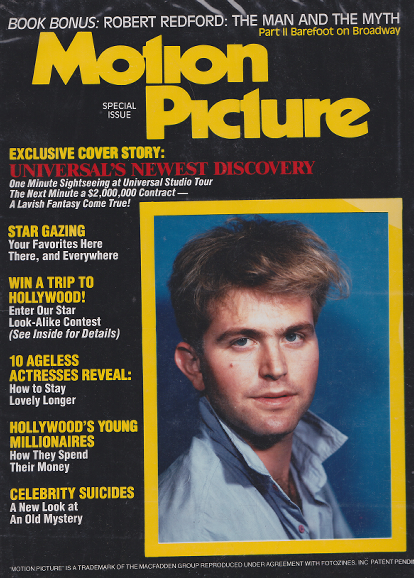 The path was clear for him to become the newest star in the celluloid heavens. 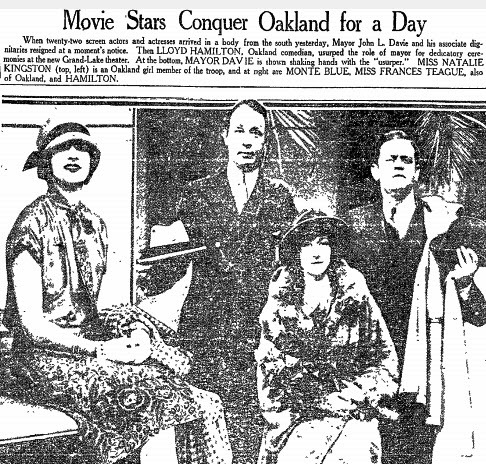 His hometown newspaper, The Oakland Tribune, sang his praises. 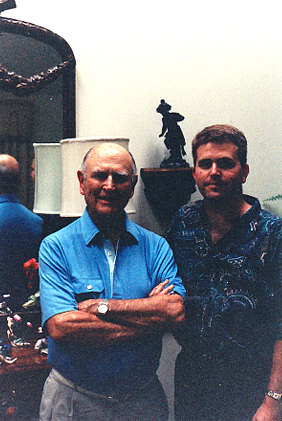 In an interview from his home in Memphis, Tennessee, in 1992, Hugh Allan told me the story of his instant success. 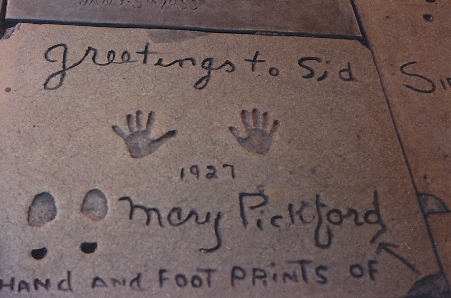 Mary Pickford had requested a number of screen tests be sent over to Pickfair for her to review. She had little trouble selecting the handsome hopeful. 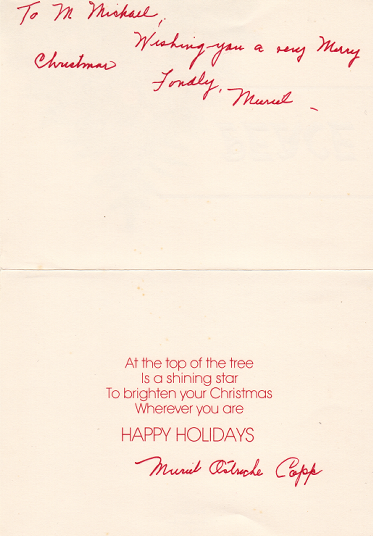 Hugh was introduced to the star on the set of Little Annie Rooney. Mary, while she didn’t mean to be, was intimidating. Mary did her best to put her leading man at ease. Mary’s brother, Jack, who was frequently on the set, didn’t help matters. After several days, it was obvious that Hugh would be unable to complete the film. Mary, almost as disappointed as Hugh, provided a cover that allowed him to leave the picture without the chance of permanently damaging his fledgling career. The studio issued a release, stating that Hugh had broken an arm after falling from his roof and would be unable to finish his commitment. Hugh was brought back to the set, where the prop department placed a cast his arm. Mary insisted a photograph be taken for the press. The press took the bait. Hugh’s reputation was saved. The press writes about Hugh’s “accident”. 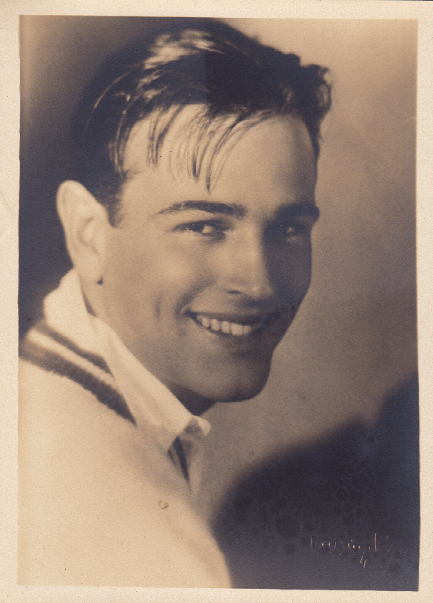 Hugh never saw the finished film–William Haines took over his role, but he remained in touch with Mary over the years. 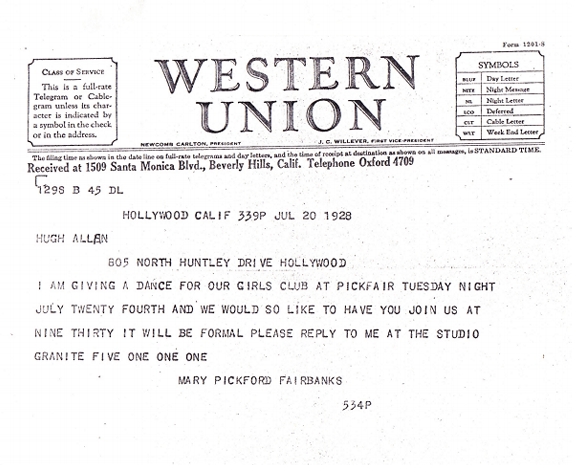 Hugh was proud of his telegram from Mary Pickford. Back in Hollywood, Hugh connected with a drama coach, an actress of the stage, who gave him acting lessons for four or five months. First National took notice and signed him to a contract. 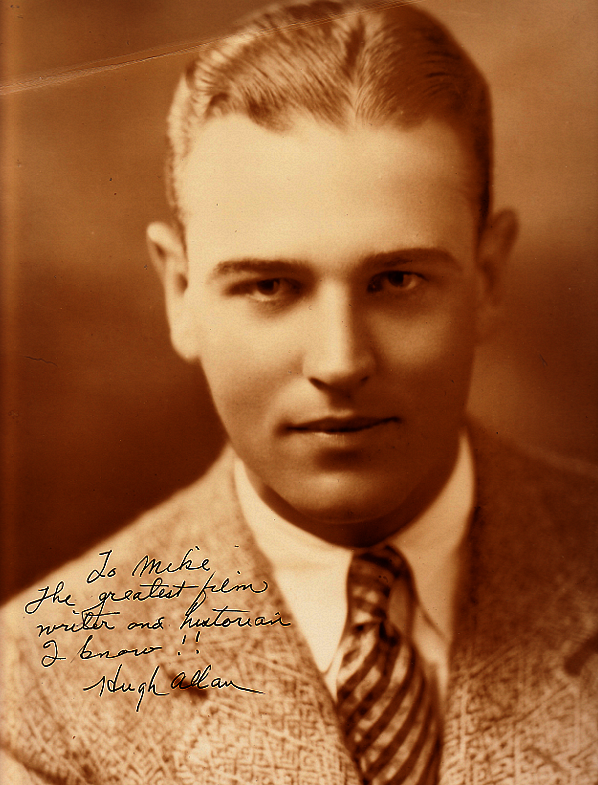 Hugh worked steadily for the next four years, playing leads opposite such actresses as Jean Arthur, Priscilla Dean, Bessie Love, Helene Costello, Jeanette Loff, and Lois Wilson. 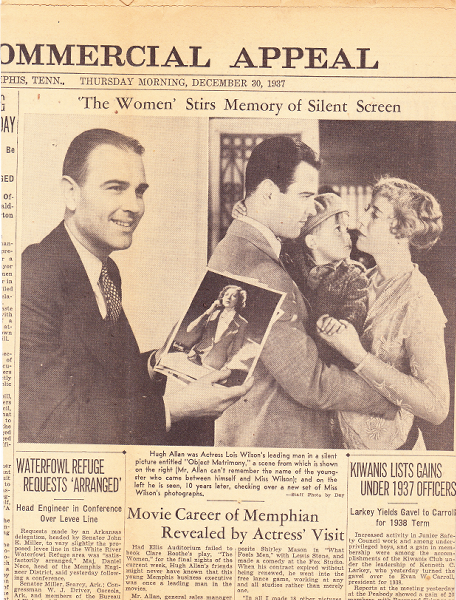 With Jean Arthur and George Chesebro in The Block Signal. To his fellow actors, he was an all-American boy. To his leading ladies, he was irresistible. Hugh Allan and Priscilla Dean in Birds of Prey. 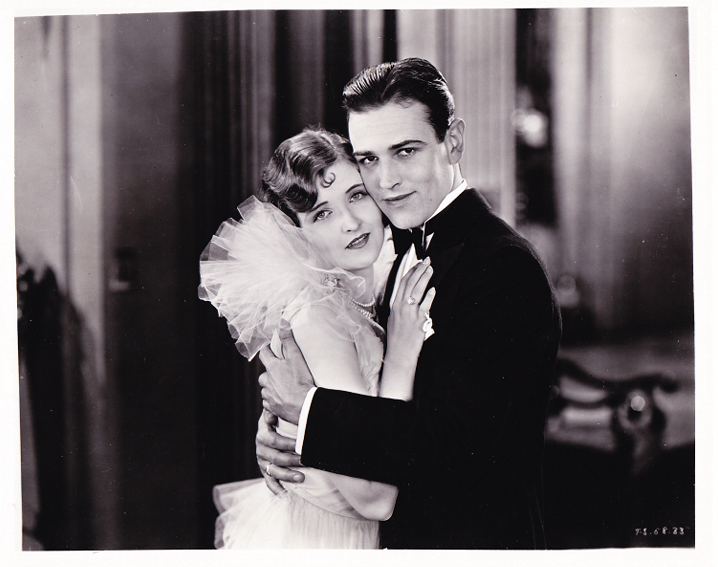 Hugh Allan and June Marlowe in Wild Beauty. 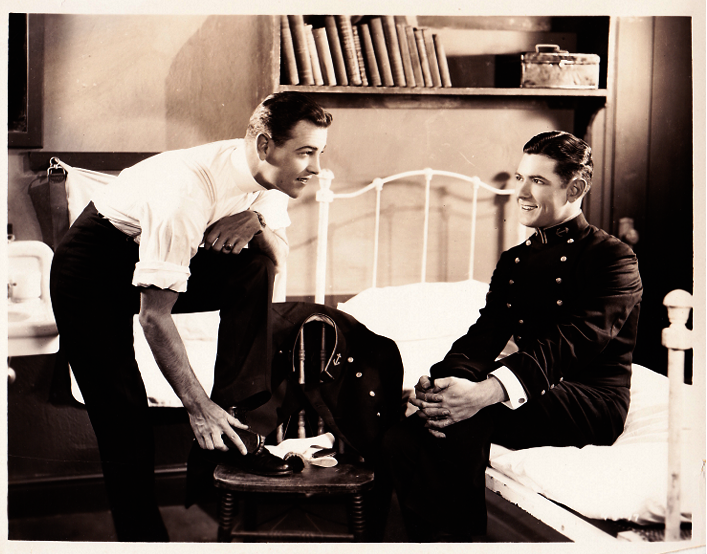 Hugh Allan and John Mack Brown in Annapolis (1928). The two serials, he said, were his best pictures. He liked the action. 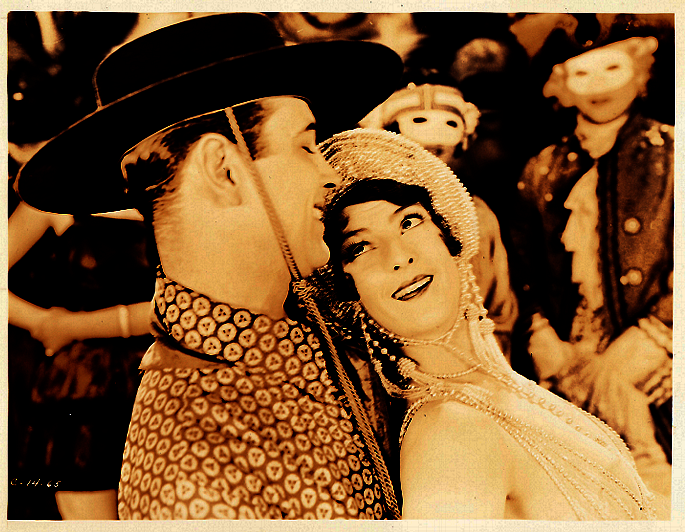 Hugh Allan and Gladys McConnell in The Fire Detective (1929). 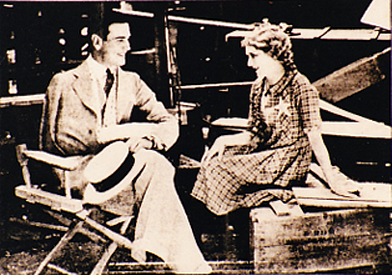 Hugh left films in 1929, following a failed film project in Hawaii. The director had taken the cast to Hawaii, ran out money, due to the stock market crash in October, and tried unsuccessfully to raise the needed funds from the locals. Hugh discovered he was filming scenes without film in the camera. The shenanigans in Hawaii spoiled his opinion of the movie industry. Hugh disappeared from the screen. Over time, he became a successful businessman in the elevator industry. 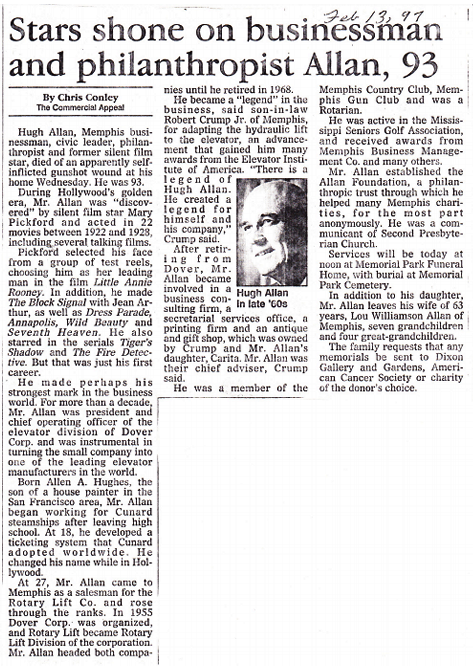 He was dubbed Memphis’ Howard Hughes. While he wasn’t particularly nostalgic about Hollywood, he was interested in the various ones he worked with while in films. 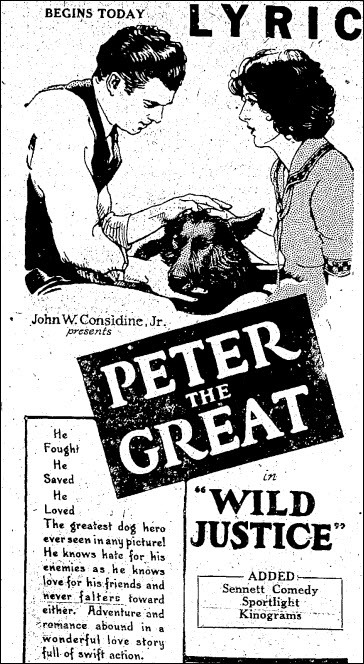 In 1937, he reconnected with Lois Wilson when she came to Memphis to appear in a play. In 1992, Hugh was the perfect host. He put me up at his country club and cleared a day so we could talk about his years in Hollywood. At noon that Saturday, Hugh drove me (with a glass of wine in his hand) to a local eatery. Hugh and Michael, August 1992. We ran out of time before he ran out of stories. Read the full interview in The Sound of Silence. 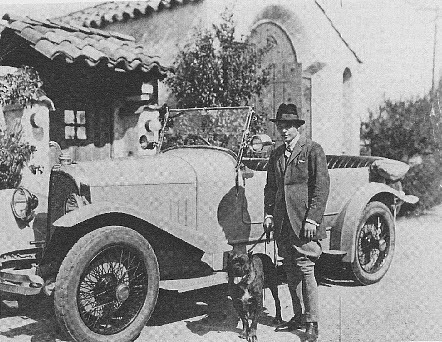 He talks about a wild party at the home of Serge Mdivani and Pola Negri and the day he ran into Rudolph Valentino in the showers at the Santa Monica Swimming Club. 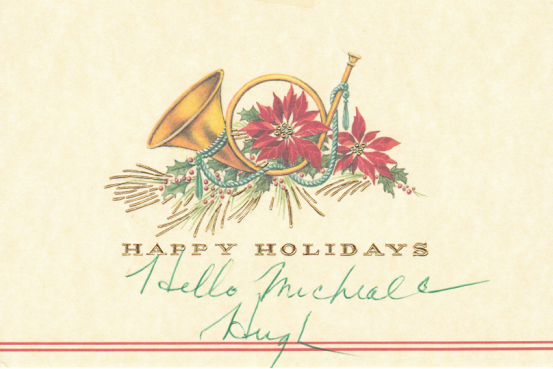 Sadly, Hugh passed away in February 1997. In one month, I will be in the heart of Hollywood! I’m making my umpteenth journey to the land of dreams, the city that never disappoints. 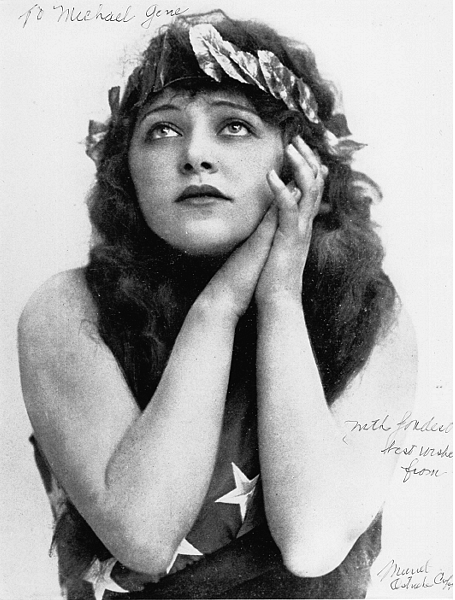 This trip is dedicated to researching my new book, Hairpins and Dead Ends: The Perilous Journeys of 20 Actresses Through Early Hollywood. It is a companion volume to my 2010 book, Dangerous Curves atop Hollywood Heels. I’ve already imagined the cover. Well, it’s a working cover. The publisher will most likely alter it in some way, but it’s a starting point. The actress on the cover is Edwina Booth, one of the subjects I am researching. 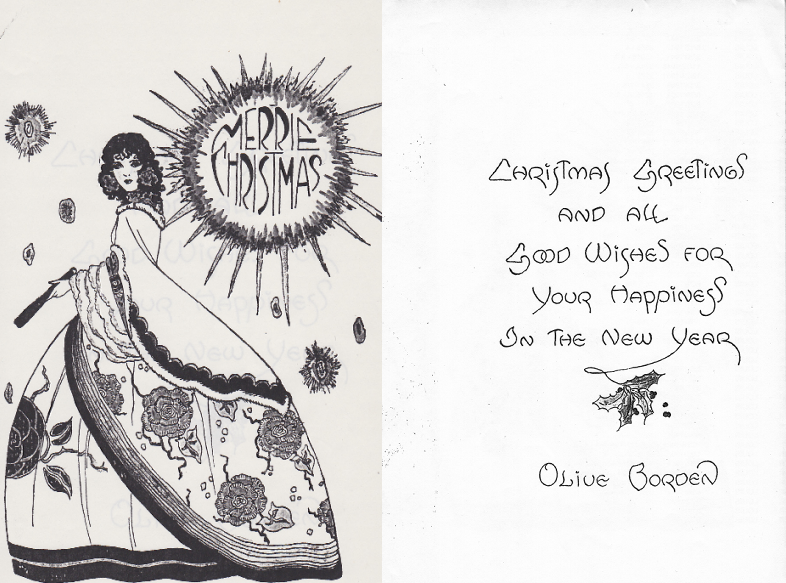 Here are some of the actresses I am including in Hairpins and Dead Ends: Evelyn Nelson, Belle Bennett, Margaret Gibson, Gladys Brockwell, Dorothy Sebastian, Mary Thurman, Virginia Lee Corbin, Kathleen Key, Mary MacLaren, Peggy Shannon, Mary Miles Minter, Lilyan Tashman, Valeska Suratt, Corliss Palmer, Lottie Pickford, Marie Walcamp, and Alma Rubens. 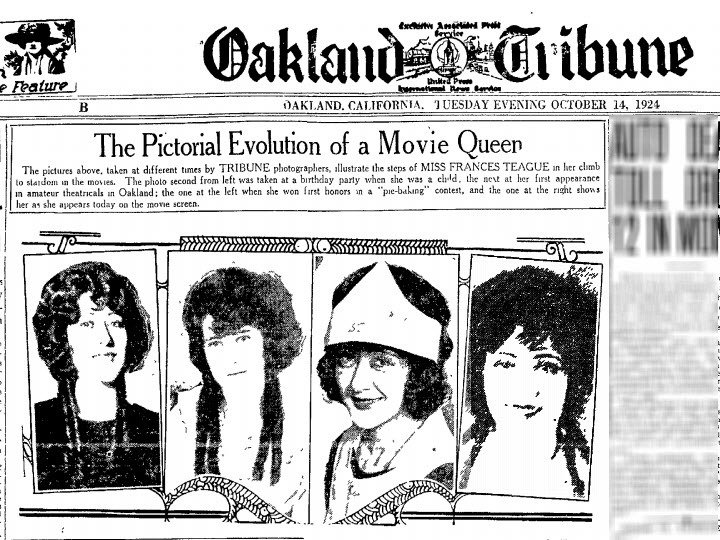 You may not know some of the names, but their stories, their journeys through early Hollywood, are riveting. On my upcoming trip to Hollywood, I’m interviewing relatives, visiting their former homes, paying respects at their final resting places, and researching their contributions to film history at the Motion Picture Academy Library. As a writer and journalist, it is important for me to visit the places where they lived, loved, and died. It helps me put together the puzzle pieces that make up their lives. Being there helps me understand who they were. 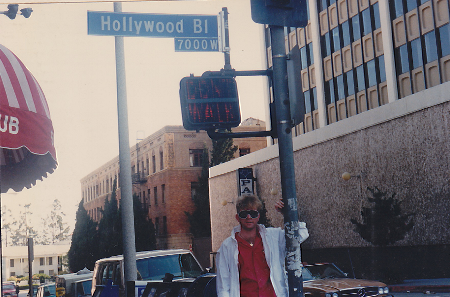 As I prepare for upcoming trip, I can’t help but reflect on my very first trip to Hollywood. It was in the mid-1980s. I had just started my writing career as a newspaper reporter. 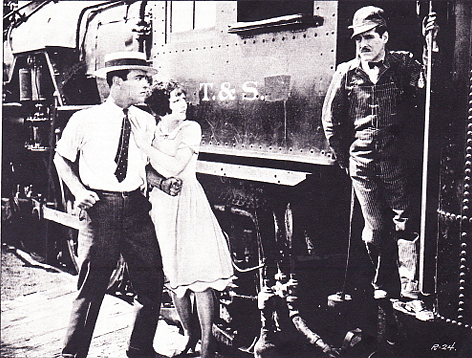 I was also interviewing former silent film actors and actresses for a column I had in Classic Images. 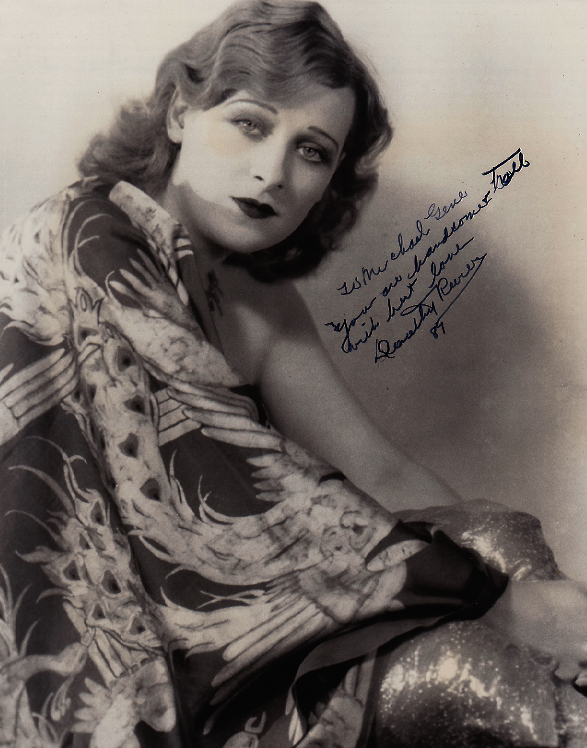 Dorothy Revier was one of the first actresses I reached out to. I thought her Hollywood portraits were stunning. 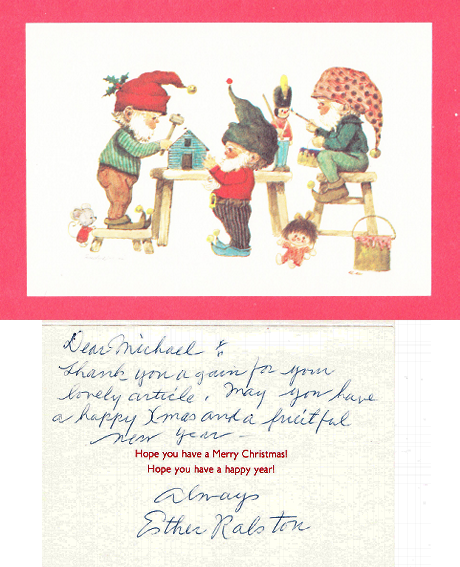 Although she was reluctant at first, we started a conversation, first through the mail, later by phone. 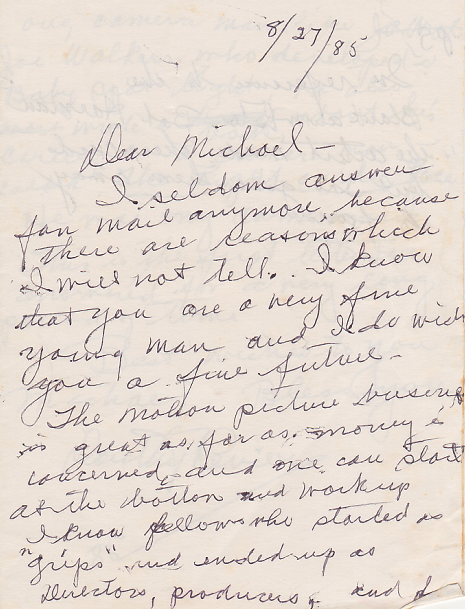 Here is her first letter. She lived a lonely existence, I suspected, in her little Hollywood apartment. She was estranged from her only child, a daughter. 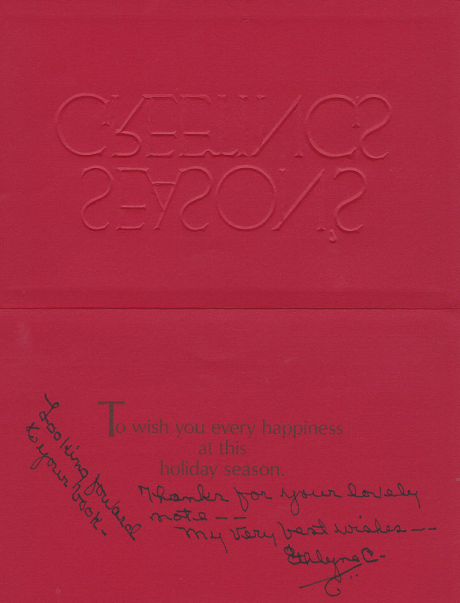 She maintained close relationships with her sisters and writer Richard Lamparski. Dorothy became a regular correspondent. 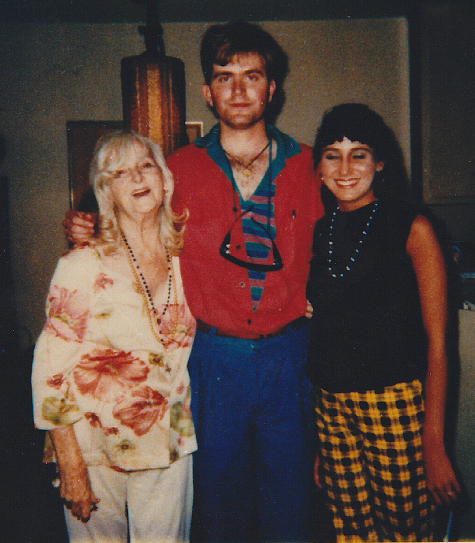 She sent pictures of herself in 1986 and urged me to visit her, if I ever made the trip West. Dorothy Revier in 1986, a stunner still! 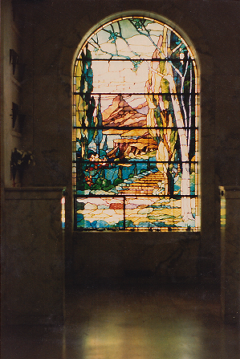 It was in the summer of 1986 that a trip emerged for me. I was invited to go with a theater troupe on their summer trip to Disneyland. I jumped at the chance. Knowing nothing about southern California, I figured Disneyland was in the heart of Hollywood. It was actually over 30 miles away. It might as well have been a million. 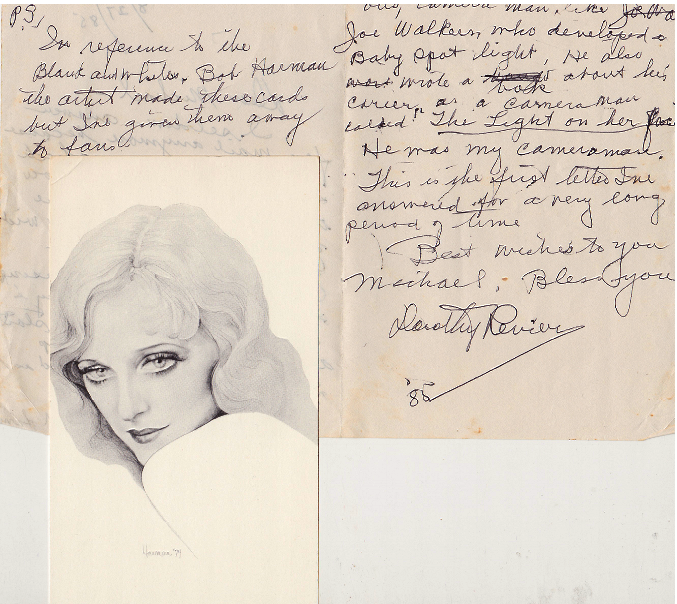 My sole purpose for joining the tour was to get to Hollywood, to see old Hollywood, to visit Dorothy Revier. Fortunately, a writer friend of mine, Joyce (her last name escapes me), offered to pick Charlene (a co-worker from the newspaper) and me up at our hotel in Anaheim, drive us into Hollywood, and show us the sights. Here’s what we did that unforgettable day in Tinseltown. 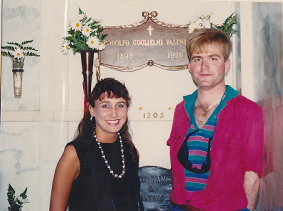 Knowing I was a Valentino fanatic, Joyce took us to Hollywood Memorial Cemetery (now Hollywood Forever) and to Valentino’s crypt. 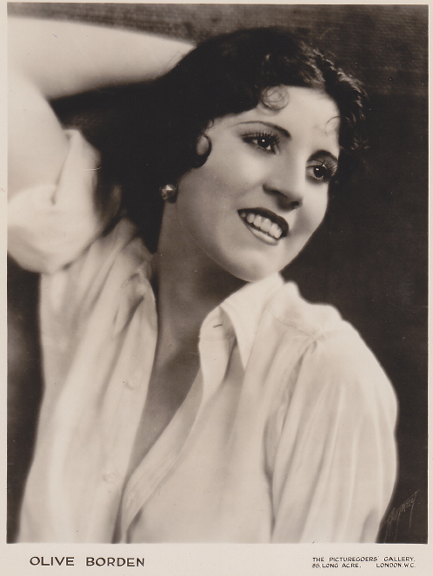 Who knew that Barbara La Marr and William Desmond Taylor were neighbors of Rudy’s? 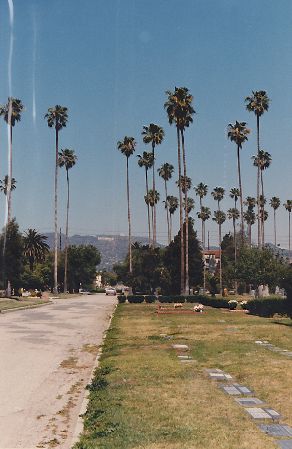 Hollywood Memorial Cemetery with the Hollywood sign in the background. We to Paramount. I looked, but didn’t see Gloria Swanson. 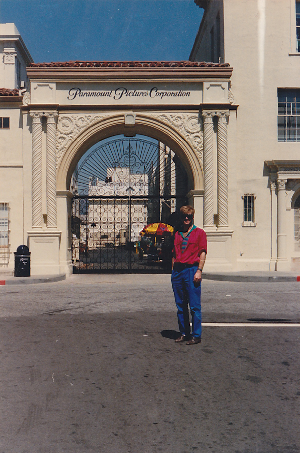 Michael at the Paramount gate. Grauman’s Chinese Theatre was a must. I marveled at the foot and hand prints. We had lunch at The Pink Panda on Orange Avenue. It’s probably long gone. 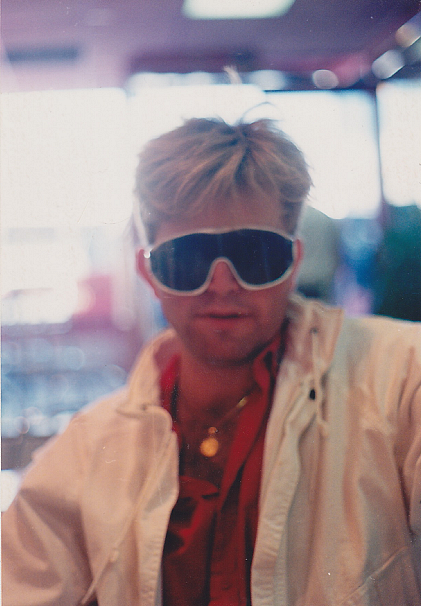 Well, the sunglasses WERE in style in the '80s. Joyce drove us into Beverly Hills. 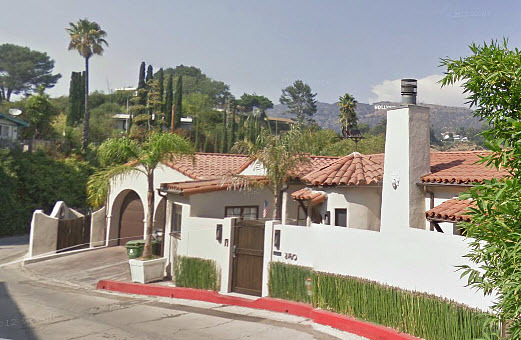 The highlight was passing Lucille Ball’s home and driving up the long, winding street to Falcon Lair, Valentino’s famed home. The view from that street, Bella Drive, left no doubt, I had arrived in the land of my dreams. Later in the afternoon, we pulled in front of 1275 North Havenhurst Drive. 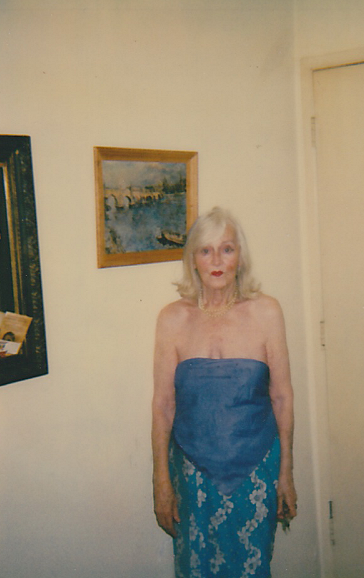 Dorothy Revier met us in the courtyard and invited us into apartment #6, her home. 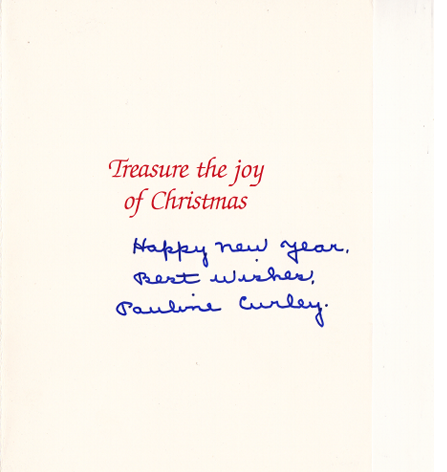 Dorothy was gracious, fun, and outgoing. 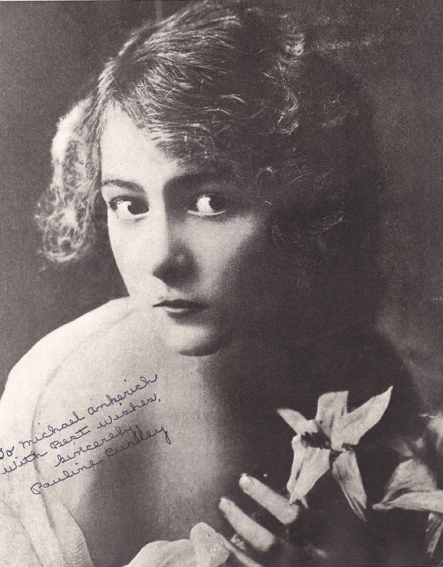 I had met and interviewed my first silent film actress. 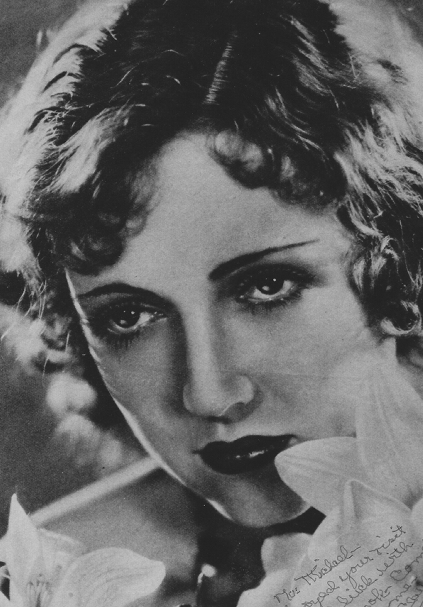 Her interview is featured in my book, Broken Silence: Conversations with 23 Silent Film Stars. 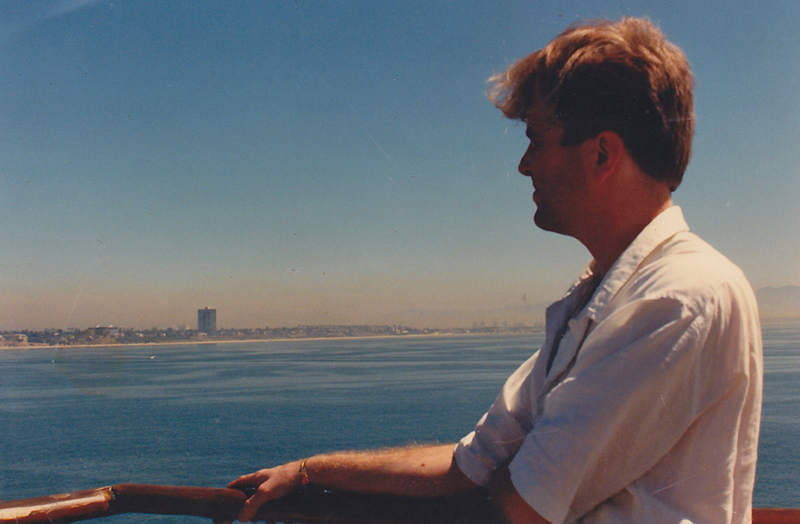 Later in the trip, I visited the Queen Mary ocean liner in Huntington Beach, but wouldn’t you know it, my sights were still on Hollywood. I even got myself on the cover of a magazine. There would be many more pilgrimages to Hollywood over the years, but I’m kind of nostalgic. You never forget your first time!